The reason for usability testing on websites is well known, isn't it? It's to get the site seen through the eyes of someone who is not familiar with it, and to see what they make of it. Just like it says in the name, Five Second Tests show you the site for five seconds and then the site disappears from view. And it has taught me a big lesson. The lesson is that if I don't know in an instant what the site is about, then those five seconds go by in a flash. I spend those five seconds trying figure it out what the site is about and I just don't 'see' anything else on the page. At a party, a doctor is commiserating with a lawyer. He says that wherever he goes people ask him for medical advice. The lawyer agrees and says he has the same problem - people are always asking him for legal advice. The doctor asks him how he deals with it, and the lawyer says that it's simple - he sends the person a bill and pretty soon the word gets around and it stops. Next morning the doctor gets a bill from the lawyer. Stoats are stoatally different and weasels are weasely distinguishable. Stoats are bigger - but a big weasel can be as big as a small stoat. And female stoats are smaller, so it terms of size, they are easily confused with weasels. Stoats have a black tip to their tail - but you will be lucky to see it when the animal crosses the road or track in front of you. Stoats sometimes turn all white in winter, whereas weasels do not - but that is not going to help you distinguish them in summer. So How? Stoats are slinky and bounce along. Weasels zip along like little rockets. I saw a Japanese painting that had been painted on glass. It was painted on the back of the glass, which meant that the artist painted the foremost features first. Then he/she painted the parts behind. How clever and how difficult. The painting on glass gave me the idea for future makeup. A person will dial in their preferred makeup and the machine will make a sheet of clear plastic with the makeup on it - with the finest detail nearest the sheet and the layers built up to the foundation creme. The sheet will be moulded to the shape of that person's face. Lasers will scan the face to do that. They won't need to scan every day, just now and again as the face ages. The machine will place the sheet on the person's face and the heat of their face will transfer the makeup in a second. All you have to do is peel off the plastic sheet and voila! - makeup all done. It will be a flop at first because people like to do their own makeup - in the same way that people liked to do their own cooking. But then people will become hooked and it will take off big time. There will be portable versions in cars and self-service versions in the ladies' rooms of swanky hotels and restaurants. And everyone will be happy. Qatar is on the Persian Gulf, with a land border with Saudi Arabia. It is about one twentieth the size of Great Britain. It is the world’s richest country per capita. It has the world’s third largest reserves of natural gas and reserves of more than 25 billion barrels of oil. It created the Al Jazeera news network. It has investments of hundreds of billions of dollars in Western companies. It will host the 2022 FIFA World Cup. The Al Thani family has ruled Qatar since the mid 1800s. When the Ottoman Empire conquered and ruled Qatar from 1871, the Al Thani family forced through semi-autonomous rule. The British took over in 1916 and withdrew its military in 1968. In 1968 Qatar joined with other States to form what became the United Arab Emirates but then quickly broke off from the other States. It exports to Japan, South Korea, India, Singapore, and China. Its major military supplier seems to be France, although the USA may have provided a defence shield against possible attack from Iran. The US and UK share an airbase in Qatar. An article of September 7th 2014 in the New York Times describes international accusations that Qatar funds and supports Al Qaeda in Syria, the Taliban in Afghanistan, Hamas in Gaza, the Muslim Botherhood across the Middle East, and Islamic State in Iraq and Syria. Until South Korea's Constitutional Court ruled on 26 February 2015 to abolish the crime, adultery was a criminal offence in South Korea and had been since 1953. The first adultery case involving celebrities was in 1960 involving actor Choi Moo-ryong and actress Kim Ji-mi. The couple were in a relationship outside of marriage. In 1970, a local TV station famously aired video footage of the well-known actress Chung Yoon-hui in a jail cell for committing adultery. Adultery Is No Longer an Affair of the State in South Korea. What good headline, with the unspoken link to 'affairs of the heart'. In the past six years, close to 5,500 people have been formerly arraigned on adultery charges - including nearly 900 in 2014. But the numbers had been falling, with cases that end in prison terms increasingly rare. The maximum sentence for the offence under the law was two years. That said, South Korea was not the only country to have criminalised adultery Taiwan’s Criminal Code Article 239 provides that "married spouses who commit adultery be imprisoned for up to one year." The Korean War lasted from 25 June 1950 – 27 July 1953. I can't help but wonder what relationship there is between the origin of the statute and the Korean War. I recall everyone wanted to know why the UK election turned out the way it did. Everyone wanted to know how we got here - like it’s someone else that voted in the Conservatives. Who did it? It’s the great English public that did it. The English public - not the great British public. In Scotland they voted for the SNP (Scottish National Party) - a party that is against the austerity plan of the Conservatives and that is committed to devolving from the UK. Why did the English vote for the Conservatives? I think it’s because for all the pain the Conservatives have caused to the poor and the disabled in their term of office, the economy seems to be on an upward trend. And people don't want to rock that boat. And all that talk of getting the Conservatives out because they were cruel, arrogant bastards who only cared about lining the pockets of their chums - it turned out to be just talk. All that talk about the Conservatives destroying the Welfare State - housing, the NHS. It’s a class-ridden society like it’s always been – except for those pesky Scots who won’t toe the line. All Ed Miliband’s talk of including everyone – he must have been thinking of a different society. One in a parallel universe. It turns out that not only do people not care, they don't even wish they cared. I guess that is the attraction of anonymous voting - blame someone else for the result. Here are the numbers for the seats, the number gained and lost, the actual number of the popular vote and the percentage of the vote that the number represents. Politics is not just about these leading parties, there was also the Democratic Unionist Party, Sinn Fein, Plaid Cymru, and an Independent - all got seats - as well as approximately 120 parties that got no seats and had votes ranging from a few tens of thousands down to fewer than twenty votes. Because of the peculiarities of constituency boundaries, the SNP won 56 seats in the House Of Commons with 4.7% of the popular vote. The Green Party, on the other hand, won only one seat with 3.8% of the popular vote and UKIP also won just one seat with 12.6% of the popular vote. Of course, the percentages don't entirely reflect the inequalities because it depends upon what constituencies the smaller parties choose to fight. If UKIP had fought seats in Scotland, their gains and losses would have looked very different. So the total of the popular vote doesn't show the whole story - but plainly something was and is not working - or no longer working - with the first-past-the-post system. Candidates in a UK election pay a deposit and it is forfeited if they don’t get at least 5% of the vote. If a candidate gets 5% or more then the deposit is returned to him or her. The deposit for UK elections is currently £500 and the Liberal Democrats lost £170,000 in deposits. According to Open Europe, it would have all turned out very differently if we had had proportional representation in the UK election. The Week reprinted a letter from Lord Leach of Fairford, Chairman of Open Europe, to the Times. The letter states what would have happened had the German form of PR applied in the general election. Under that system, any party getting less than five percent of the vote is not allocated seats. The reason for that is to prevent a huge number of parties with one or two votes each swamping the actual business of government. We would have had the Conservatives with 275 seats, labour 229, UKIP 92, Lib Dems 54 and no seats for any of the other parties. That is, the SNP would not have got any seats at all. 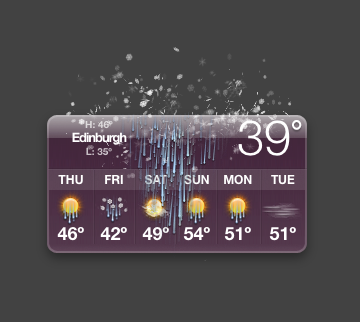 My dashboard widget seems to think the weather is going to deteriorate over the next day or two. My wife told me she had just heard Prince died. I had to put on Purple Rain before I opened the news channel. Blogo is a publishing app for Mac, iPhone, and iPad. They just announced it was changing from a paid model to a free + paid features model. The reason is that over a two-year period their app was downloaded illegally more than 60,000 times. You can download the app for Mac on the MacAppStore and that is what I am using to write this article. You can read Blogo’s article on how they decided to go for a subscription model because they couldn’t fight the pirates. As they say, they closed down 2,000 torrent links and it was biting into the time they wanted to devote to make the app better. As you know, nature speaks all the time. It tells a story, and at its most basic level it is crafting a view for you and I and everyone to accept. But it child's play and benign compared to the crap we sell each other. Which is reason enough to want to watch nature unfold - away from the selling-machine. I wouldn't want anyone to think I am talking about goods and services when I am talking about what we sell each other. I mean something much wider - the desires inside so many people to sell a story about themselves - to promote a view to prop up their own world view, to be lodged in the hearts of others, to be promoted in the eyes of the world. Thank God there are some nice people in the world, or I would feel much worse. I did a calculation some years ago when I read that Coca Cola sold 78 million bottles a day. I figured that on a rolling basis, everything that was sold was drunk, so that meant that 78 million bottles were drunk every day. Then I estimated that it took five minutes to drink a bottle of coke. That's on average of course. Some people will just guzzle it down and other people will take it slow with their burger and fries, or tacos, or noodles, or whatever - because Coke is a worldwide brand. So how many five minutes are there in a day? And how long is 'a day'? It's obvious that a day must be a 24 hour period. So that's 12 five minutes in an hour and 12x24=288 five-minute periods in a day. So if there are 78M bottles sold every day, then there are 78 million divided by 288 being drunk at any one time. That's 271,000 people. Of course, they won't all be synchronised and lifting the bottle to their lips at the exact same time, but even chopping that number by 10, that's still probably 27,000 people who are lifting a bottle of coke to their lips anytime you do. That's at any time, wherever you are, night or day. When you drink a coke, there are more than a quarter of a million people doing the same thing in the same five-minute period and probably somewhere around 30,000 people who lift their coke to their lips just when you do. Anyway, on SimplyZesty I read that the number has gone up and now it's 1.7 billion bottles (and cans) being served every day. That's quite a step up. That's 18 times as much. Any time you drink a coke, somewhere around four-million-eight-hundred-thousand people are doing the same. And somewhere around four-hundred-thousand people are lifting their drink to their lips more or less when you do. Does He Go Home Or Does He Pray? I picture the last man (or woman - this is a gender-neutral article) who believes in a particular religion. It could be any religion, well-known or not. I am not picking on any religion and in fact to set the scene I am widening the meaning of religion to take in anything that demands adherance. For example, it could be a young man in a city who is part of a gang. And now picture this scenario: All the other gang members are bumped off in a showdown with a rival gang. In fact, all the members of both gangs are killed in that final bloody shootout - except for our guy. So now the last, lone gang member is without a gang. There is not gang to which he can attach himself. What does he do? What does he do with the gang paraphernalia that he has been wearing to show he is a member of the gang? Is it meaningless now? Does he go on doing ritual things that the gang members did, like the way he greets friends? OK. you get the idea. There is something faintly ridiculous about this man showing faith to something that no longer exists. And the notion of him being ridiculous works even when the gang exists. When the man is taken out of his surroundings and comes up against the hard edge of a different reality, we see how deep his sense of self runs. There have been several films and more than a couple of reality shows that explore this. But I am interested in the man who is the last of his religion. And here I mean religion in the classical sense of having a relationship with a transcendent being. After all, there may be a God but who is to say that he/she/it is the Hindu God, or the Jewish God, or the Christian God, or the Muslim God, or … etc. So when all but the last adherent of a faith has died, what does the last man do? Does he say - 'Forget this for a game of marbles; I'm going home' or does he pray? I am still amazed that Saddam Hussain in Iraq and Muammar Gaddafi in Libya didn't do deals to save their necks. What kind of people were they that they could not see the writing on the wall? These are probably the strangest events that I do not understand from the past decade of world history. Whether you think that sounds a lot, thirty years ago there were 45,000 elm trees alone in Edinburgh. Edinburgh and Brighton are 'the' place for elms - planted by the Victorians. Edinburgh has been losing a thousand elm trees a year for 30 years, and now there are just 12,000 left. They lost 1,200 in 2012 - probably because of a mild winter followed by a spring with temperatures at 20°C and no wind - perfect conditions for the elm bark beetle to fly off and find another elm. The elm bark beetle is the innocent carrier of the Dutch elm disease - a fungus that spreads along the vascular system of the tree. The tree reacts by shutting off its vascular system ahead of the fungus and so effectively kills itself. The fungus would kill the tree anyway eventually but because of the way the tree reacts to protect itself from the fungus, a tree can sometimes go from the first signs of infection to a dead tree in a month. The original infestation came from the Far East in the early nineteen hundreds and reached Scotland in the 1970s. There is no treatment - a research team at the Botanic Gardens in Edinburgh tried fungicides for the fungus and pheremone traps for the beetles, but they don't work. There are two kinds of elm in Edinburgh. There's English elm, which breeds by suckers, so that all English elm trees are clones. And there's Wych elm, which breed by seed dispersal. It was thought that Engish elms being clones would be more susceptible to Dutch elm disease, but time has shown that English elm and Wych elm are both susceptible. Edinburgh Council have tried other elm species such as Ulnus Regal - but it too has succumbed. In the USA they are now breeding fungus-resistent elms. However, there is very little money in the UK for research. So the Council is fighting a losing battle - a rearguard action to slow down the advance of the Dutch elm disease. Hawaii is the latest in a series of island chains reaching back millions and millions of years. The chain that is above the water now is like the latest pearl in a string that stretches back to the north-east of Russia near the Baring Straits. As I understood it, the weak spot in the plates led to an eruption that formed the first set of islands. Then the plate moved onwards to the south east, cutting off the source that fuelled the formation of the islands. Over time those islands wore away beneath the sea and another island chain spurted out of the weak spot hundreds of miles further along the path. And now with sonic testing, we can see the remains of the islands like bumps in the sea bed, stretching like a necklace across the Pacific – recording the passage of events over millions of years. I was so amazed and happy to learn this. I honestly cannot say why. But it is satisfying somehow. Petition - Do Not Repeal The Fox Hunting Ban - Yes, the Conservatives are having another go..
Because of opposition to it, the Government dropped their plans to put the repeal before the House last year. In February of this year Cabinet Office Minister, Matthew Hancock, renewed the Tory manifesto pledge that could see Labour’s Hunting Act repealed, saying the party was “committed” to it. There are 106,201 signatures to the petition thus far. You can sign it if you have not already done so. In a modern, civilised society, there is no place for this grotesque and cruel pastime. The previous government banned the practice, but the new government is planning to legalise hunting foxes using dogs. This is a barbaric and outdated activity that should stay where it belongs - in the past. A cynosure is a person or thing that attracts a lot of attention or interest. The word comes from the Greek and is a combination of dog and tail - kun-oura. And that is because of the appearance of the constellation Ursa Minor which contains the pole star. And of course the pole star is the centre around which everything appears to rotate. Oil Divestment - Unintended Consequences? I am impressed that the divestment movement is doing so well. That said, I still stand by the worry I have which is that for every stockholder that divests there must be a stockholder that invests (a buyer and a seller) and if the movement is to divest then prices will drop. When prices drop, the value of the oil companies drop. The investors get nervous and that starts a cycle. The risk is that the ones who step in to buy are the ones who don’t care what the companies do - so the worst traits and behaviour are given more free rein - more shortcuts - more Gulf Of Mexico oil spills. China’s efforts this week to stem the tide of losses on its main stock market failed on Friday when the Shanghai Composite index plunged a further 5.8%, taking the drop in share values to 28% since their June peak. Panic selling wiped more than £2tn off the value of Chinese-listed companies and traders signalled the rout would extend into next week. The authorities had cut fees and eased borrowing rules that make it cheaper to buy shares in the hope it would cheer investors battered by the relentless selling since 12 June. A promise by the main stock market regulator to tackle concerns of market manipulation, which has sapped investor confidence in recent days, also failed to halt the slide. At the moment there’s panic in the market, because we have lots of retail investors,” said Wei Wei, an analyst at Huaxi Securities in Shanghai. “We’ve never experienced anything like this in China’s stock market, the speed of the decline and the scale of it." The Chinese stock market is quite small. That is, there are not many investors compared to the size of the economy and the number of Chinese people. So the ups and downs of the market might not reflect the direction of the whole economy, particularly if the investors have not learned to hold rather than sell at the first tremor. Yes, there's that. But there are other factors. There is the sanctity of the dollar. There is the size of China's foreign dollar holdings. There is the question of relations with the West and the ongoing sanctions against Russia. There is a lot that is not obvious and which may play a part in what is happening. I don't see how it all works, but I sense that what is going on may not simply be a slowdown in the Chinese economy. 'I came across an article recently in which the author makes an aside about the alternative spelling of 'lede' - as in the 'lede paragraph'. I am familiar with the alternative spelling and the meaning, and one might think that the alternative spelling is just an old-fashioned version that has now mostly fallen into disuse. lede (n.)By 1965, alternative spelling of lead in the newspaper journalism sense, to distinguish this sense from other possible meanings of the written word, perhaps especially the molten lead used in typesetting machines.